Egyptian striker Mohamed Salah has won the Swiss Golden Player Award 2013 an award given by the Swiss Association of Football Players (SAFP) for being the best player in the Swiss league during the 2012/2013 season. He received the prize at a ceremony on Monday. 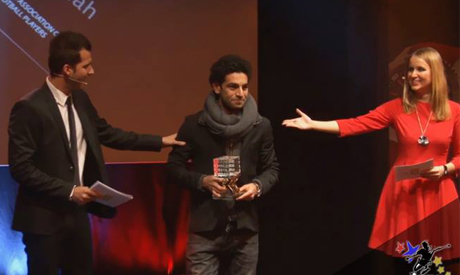 "I would like to thank my teammates at Basel who helped and taught me a lot," Salah said after receiving the prize. Since joining Basel last season from Egypt's Arab Contractors, Salah has quickly established himself as one of the team's key elements at both the domestic and continental levels, scoring nine goals in all competitions. Salah, who won the CAF Most Promising African Talent of the Year award in 2012, helped Basel to win the Swiss league title last season and finish runner up in the Swiss Cup. He scored twice for Basel in both UEFA Europa league, where it reached the semifinal, and the UEFA Champions league last season. The 21-year-old recently scored the only goal in Basel's 1-0 victory over Jose Mourinho’s Chelsea 1-0 in the European Champions league. He also scored twice in Sunday's league draw with Young Boys. Recent reports in the British media suggest Tottenham Hotspur are lining up a January bid for Salah, who has been consistently praised for his pace and trickery down the flanks. He has scored ten goals for Basel in all competitions so far this season. Salah is pure talent and the best example for young players striving to reach a higher level in their game. Salah sets the best example on and off the field and he is certainly blessed by God for his work ethic and behavior. I wish Salah the best of success and hope to see him in one of the top clubs in the world. Personally, I think he is the next Messi, but faster and younger with the genes of a Pharaoh :) Real Madrid, Barca, Chelsea, Manu or Man City - nothing else.